Team Angola with the Angola Field Group team, proudly wearing Team Angola shirts, November 2013. Antonio Bartolomeu is third from the right and Captain Tita is in the centre. The Angola Field Group offers its condolences to the family of Antonio Joao Bartolomeu, the crew member of Team Angola who perished in the storm that knocked him overboard during the Cape to Rio race, January 5th, 2014. All other crew members are out of hospital now except for Captain Tita who is reported to be starting to walk. 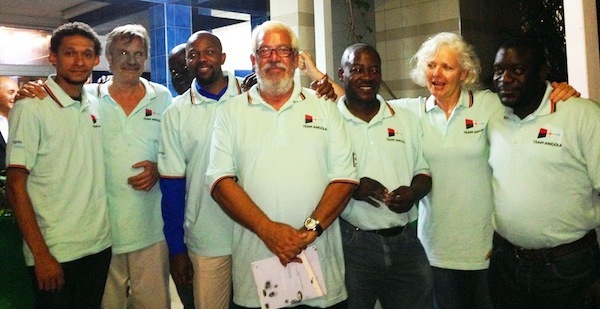 Team Angola gave a presentation to the Angola Field Group on November 14, 2013. It was an evening with an atmosphere of happy anticipation as Field Group participants sent the sailors off with well wishes. The start of the Cape Town to Rio Race on Saturday (January 4) is overshadowed by a tragic death and many injured sailors and yachts in distress. In a heavy south-west storm with wind speeds of up to 60 knots and waves with heights 6-10 meters, eight of the 36 starters in the 3600 miles long race from South Africa to Brazil on Sunday morning sent out several distress messages to the race committee. A serious accident occurred on board the “Bille”, a Bavaria 55 that was sailing alongside her sister ship “Mussolo” for a sponsor from Angola, during which a crew member lost his life. The experienced crew of “Bille“ with their Portuguese skipper Luis Manuel de Oliveira Da Silva was already on the way back to Cape Town. Problems with the extreme weather conditions, the crew decided for security reasons to give up, on Sunday (January 5) around 15:00 hours, a gigantic wave broke over “Bille” causing a severe knock down. During this capsize the mast broke and a sailor was thrown from the cockpit into the water. The 46-year-old employee of a radio station Antonio Joao Bartolomeu from Angola could not swim back to the boat. He was one of the best sailors from Angola. The crew of “Bille” was later rescued by a frigate from the South African Navy, and cared for there by the medical ICU. The “Bille” was recovered hastily by the Navy and initially taken in tow. The towing connection was later cut because the frigate had to attend to more injured sailors from other participating yachts. “Our thoughts in these hours are with the Crew of” Bille “and relatives of the dead sailor. As we know, all the other crew members are now in safety and on the mend. The second Bavaria 55 from the Angola team has weathered the storm without major damage and is on the way to Rio, “says Daniel Kohl, Product Manager & Head of Marketing at Bavaria GmbH.